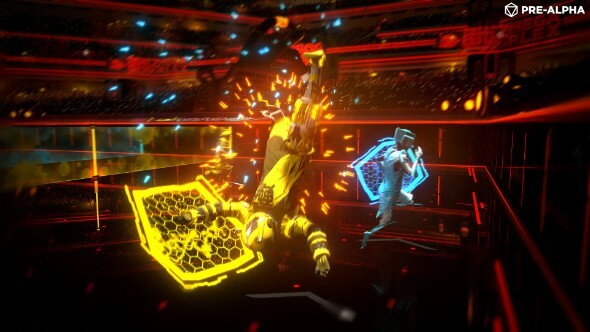 Laser League is a game about dodging laser traps and projectiles in a neon arena. Your aim is simply to last as long as you can and make sure your opponents trip up first. It’s intense and precise, with sharp edges reminiscent of Asteroids. Despite the 3D graphics, it looks like it could belong on a coin-op machine in the ‘80s. Related: the best indie games on PC. But nailing that arcade simplicity has been tough for OlliOlli developers Roll7. Exactly how do you get a glowing, emissive arena to look precise? And how intense is too intense? As it turns out: somewhere around the point a game starts keeping up you up all night, even after you’ve stopped playing it. Originally, Laser League was named Cosmic Ultra-Neon Tactics. “We thought it’d be clever because the press wouldn’t be able to abbreviate it, but actually it was childish and stupid,” studio director Simon Bennett tells us. He speaks from experience: Roll7 used Fusion to build the entirety of their side-scrolling shooter Not A Hero, and “pushed the engine to the edge of what it was capable of doing.” For Laser League, they knew they needed something different: first working with Unity, before hopping over to Unreal Engine 4. 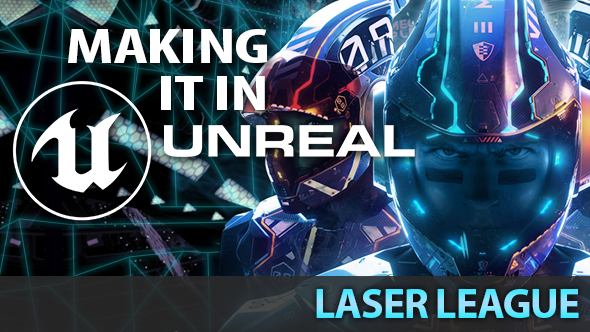 While the technical team worked to port their prototype into Unreal, the rest of Roll7 knuckled down on the art style – landing on a neon aesthetic somewhere between a Daft Punk music video, a GoPro advert, and Tron. The studio soon made good use of Unreal Engine 4’s support for shaders. Shaders are the tools that enable the creation of complex light, darkness, colour, and effects work in games – everything from bloom to cel-shading. In Unreal, a simple interface allows developers to build these effects by linking nodes together. There has been a lot of tweaking. In a game as pixel-precise as Laser League, it’s essential that the stadium remains distinct and readable at all times. 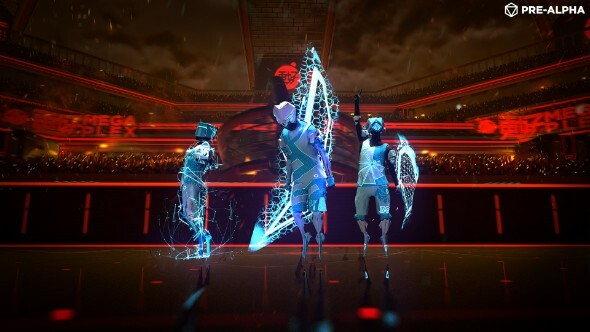 Taking Laser League’s multiplayer online has introduced some intriguing new problems. Beforehand, input lag and human perception were the only factors influencing reaction times and perfect moves. Now, Roll7 had to worry about network lag too. “We actually had a point recently where we were looking at some of the higher level mechanics of the game, and the time a player had to realise that a situation was going to happen and react to it with a counter,” Bennett recalls. “And that was so close to [the limits of] human perception, that network lag on top made it frequently impossible to do. 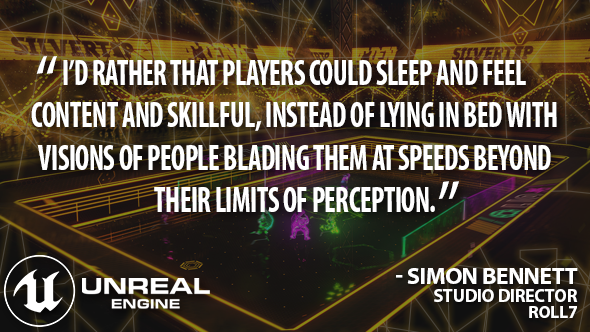 A few months ago, after a testing session in Devon, players reported that they had trouble sleeping – such was Laser League’s intensity. 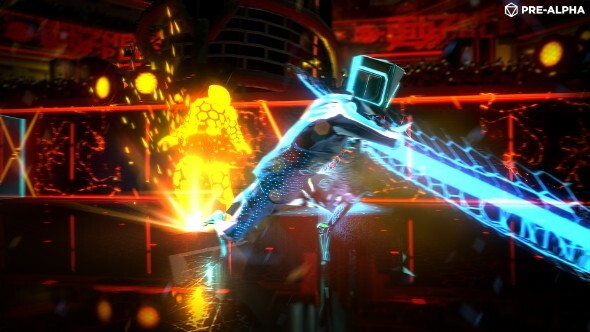 But the developers realised that Laser League’s speed had pushed the game into a realm where it was no longer fun. So they slowed it down by 10%. They’ve since tested again with the same group of people, with less frightening results. Laser League is currently available through Steam Early Access. Unreal Engine 4 is now free. In this sponsored series, we’re looking at how game developers are taking advantage of Unreal Engine 4 to create a new generation of PC games. With thanks to Epic Games and Roll7.